Fred McQueen (left) and Makoto Fujita (right) in Best Wishes for Tomorrow. The Skinny: This re-creation of a true-life war crimes trial asks all the right questions, but asks them in a less-than-compelling fashion. The film is still admirable as one of the more balanced Japanese takes on World War II. Kevin Ma: History goes to court in Best Wishes for Tomorrow, a Japanese fact-based drama from director Takashi Koizumi. Once an assistant director for Akira Kurosawa, Koizumi only dared to take on the film's subject matter after his previous film The Professor and His Beloved Equation became a minor hit in Japanese theaters. 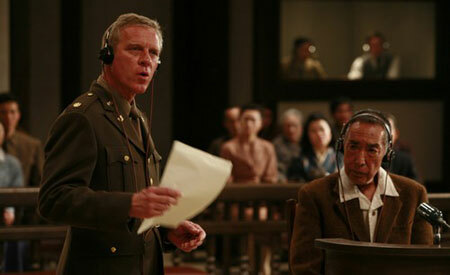 Co-written by Koizumi and foreign author/playwright Roger Pulvers (presumably chosen for the significant amount of English dialogue), the film recreates the war criminal trial of Japanese Lieutenant General Tasuku Okada using transcripts from the actual trial. The result is a film that has a compelling backstory and interesting themes, even though they don't translate effectively into cinematic terms. After the Japanese defeat in World War II, Lt. Gen. Okada and other captured Japanese military officials were put on trial for war crimes. Okada and his subordinates went on trial in Yokohama for ordering the execution of captured American fliers after only abridged trials. The fliers carried out discriminate bombings that targeted only civilians - the crux of Okada's judgement of the fliers as war criminals, and the rationale for their execution. Okada is the only one who goes on trial; he's apparently such a model officer that he takes on full responsibility for his actions in order to save his men's lives, plus he even gives them massage treatments while in prison. Despite the dense background, Pulvers and Koizumi show only Okada's trial and its aftermath, with no flashbacks to the war, and only Yutaka Takenouchi's narration connecting the rest of the dots. In fact, the film is so focused on Okada's trial that the full names of characters other than Okada are never revealed. Compared to other recent Japanese World War II films such as For Those We Love and Yamato, Best Wishes for Tomorrow can certainly be considered more thoughtful and cerebral. For one, the opening narration points out that Japan also carried out indiscriminate bombings during the war that caused civilian deaths in China. However, that point is never brought up again, as the film becomes an overly sentimental (cynics may even say wishy-washy) portrayal of a man who ordered the beheadings of 38 men. In an attempt to escape accusations of being hypocritical, Koizumi and Pulvers paint Okada in an honorable and positive light while also delivering a "Can't we all just get along?" message that lets both the Japanese and American armies off easy. It is that portrayal that is both the strength and weakness of the film's ideology. Although the writers manage to keep the portrayals as balanced as possible, the film's neutrality - established often in the film's more dramatic (and fictional) moments - appears contrived. Pulvers has pointed out himself that he intentionally left out the depictions of violent acts in order to retain the film's gentle anti-war message. However, with the film taking place almost completely indoors, and in long courtroom scenes, that message is often delivered in a dry, verbal fashion. Scenes of the beheadings would have distracted from the film's quiet tone, but Pulvers and Koizumi fail to translate this true-life story into cinematic terms. The themes and philosophies brought up in the trial scenes are intriguing for those interested in the topic, but Koizumi's staging is better suited for a 2-hour stage play. The camera is often kept stationary, with Hideto Aga's proficient editing giving the film its rhythm during the court scenes. On the other hand, veteran actor Makoto Fujita gives a subtle and dignified performance as the Lieutenant General. Despite the film's stage-like style, Fujita never goes over-the-top as the central character. Even when Okada takes an absurd digression into Buddhist philosophy during cross-examination, Fujita keeps a straight face and manages to make it look believable. On the other hand, Fred McQueen (son of Steve McQueen) edges closely to overdramatic territory as tough-but-friendly™ prosecutor Burnett. Somewhere in the middle is character actor Robert Lesser, who gets his biggest role yet as Dr. Featherstone, Okada's kind and devoted defender. Even though his character is underwritten and one-dimensional, Lesser comes off as one of the film's more memorable and likeable characters.